Specific Gravity Bench - Gilson Co. 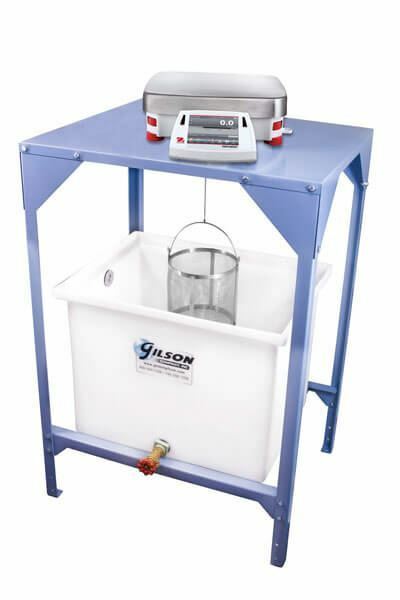 The SG-20 Specific Gravity (Relative Density) Bench allows easy suspended weighing of samples in water for relative density determinations of aggregates, hardened concrete, bituminous mixtures, refractory brick and similar materials. Bench is sturdy, heavy gauge painted steel and features three 2in (51mm) diameter holes in the top balance platform for weigh-below hook suspension of samples and thermometers. The lower support doubles as a shelf that can be adjusted to fit heavy-duty polyethylene Gilson 30gal (114L) or 45gal (170L) Plastic Water Tanks, ordered separately. Water heater and circulator accessories can be added to the tanks for precise temperature control of immersion water. Wire baskets and cradles in small and large capacity are also available for suspended weighing. The balance accessory offers versatile solutions in parts counting, percent and differential weighing, density determination, statistics and more.